Jasper High School (JHS) students hosted 20 students from am Weissen Turm Gymnasium near Poessneck, Germany (approx. 100 km south of Berlin) in April. The visit was a formal student exchange program similar to that with the Staufen Gymnasium. This was our second exchange following their inaugural visit in 1997. A group of eighteen Jasper High School students participated in a student exchange to the Staufen Gymnasium near Pfaffenweiler for three weeks in June. Although Mary Jo Meuser retired from teaching, she found a successor (Glenn Weil, a guidance counselor at JHS) to chaperone the Jasper students during their student exchange in 1999. The JHS group also spent nine days at am Weissen Turm Gymnasium in Poessneck, Germany before returning home. The retirement of JHS German teacher, Mary Jo Meuser, challenged the local JHS Administration/School Board to find a similar replacement. Mrs. Tara Deppert, a native from the Indianapolis area, was hired in June to fill this position. Many Jasper residents saw the need to not only find another teacher, but one who was committed to maintaining the local heritage as well. The Strassenfest continues to grow each year. This year included visits to Jasper from representatives of two German Sister Cities with ties to two area communities. Visitors included a brass band from residents of Wagshurst (Sister City of Celestine, IN) and a Trachtenverein Dance Group from Wasserburg (Sister City of Vincennes, IN). These visitors performed during the Strassenfest at various times and places throughout the festival. The City of Jasper formed the Jasper Partnership Commission (JPC) in 1997. 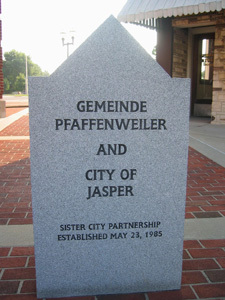 1999 activities included the planning for a group of Jasper residents to visit Pfaffenweiler in the year 2000 to celebrate the 15th anniversary of this Sister City relationship. The JPC also lead the efforts in planning the itineraries and welcoming groups from Wasserburg and Wagshurst during their visit to the 1999 Jasper Strassenfest. The JPC established a Partnership Fund in early 1999. The fund will be managed by the JPC and will be used to address expenses as they occur associated with partnership activities. Initial contributions were received from the Jasper German Club and the Jasper Strassenfest Committee. We were successful in obtaining our first grant (for $1000) from the Indiana Humanities Council for Lois Kuntz, Assistant to Mayor William Schmitt, to travel to Pfaffenweiler for the purpose of solidifying the information exchange process between the mayors of the two Sister Cities in 2000. A second one in the same amount was obtained from the Indiana Humanities Council for Martha Rasche, representing The Herald during our 15th anniversary visit in 2000. She is planning on doing reporting right from Pfaffenweiler to Jasper. A monthly Stammtisch, started in Jasper in 1998, was continued. People who are interested in practicing their German language skills congregate at the Schnitzelbank Restaurant at 7:00 PM on the last Tuesday of each month. Jasper resident, Matthias Hilger (a native of Pfaffenweiler), has been receiving email copies of the weekly Pfaffenweiler newsletter and distributing it to over 30 local friends of Pfaffenweiler. Matthias also continues to write articles of general interest and publishes these bi-weekly in our local newspaper, The Herald. Since 1997, a weekly accumulation of The Herald, is being sent by the newspaper to the people of Pfaffenweiler. Finally, the friendships, visits, letters, and phone calls between residents of Pfaffenweiler and Jasper are too numerous to enumerate. The level of interaction continues to grow as the number of new acquaintances and friendships increase with each passing year. An example of this interaction includes ten people traveling to Pfaffenweiler for their annual Schneckenfest in early September. Accommodations and itineraries in Pfaffenweiler were worked out at the individual-to-individual level with acquaintances/friends in Pfaffenweiler.